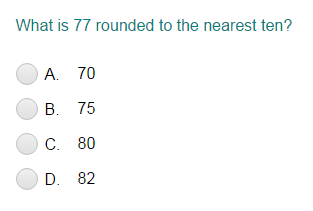 What did you think of Rounding ? To round the number to a given place, locate the rounding digit (which is the digit at the place you are rounding to). Then, check the digit immediately to its right. If this digit is 5 or more, then add 1 to the rounding digit (this is called rounding up) and change all digits to its right to 0. If this digit is less than 5, then keep the rounding digit the same (this is called rounding down) and change all digits to its right to 0. For example: To round the number 808 to the nearest ten, look at its ones place digit. It is 8, which is greater than 5. So, we round up. So, 808 rounded to the nearest ten is 810.